Australia 8-440 (Michael Clarke 106, Shane Watson 83, Mitchell Johnson 73*, Dhammika Prasad 3-102) lead Sri Lanka 156 (Kumar Sangakkara 58, Prasanna Jayawardene 24, Mitchell Johnson 4-63) by 284 runs. Michael Clarke hit another hundred while Shane Watson and Mitchell Johnson contributed valuable runs as Australia took a vital first innings lead vs. Sri Lanka. 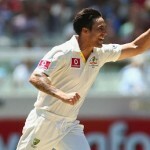 Sri Lanka scored just 156 runs in their first innings and Australia plundered 440 for the loss of 8 wickets in 129 overs. 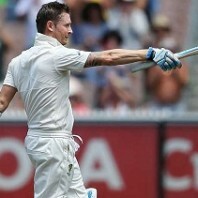 The second day’s play came to an end on Thursday, December 27, 2012, at Melbourne Cricket Ground. Earlier, the Kangaroos started the day at 3-150 in 39 overs, their skipper Michael Clarke and Shane Watson were unbeaten for 20 and 13 runs respectively. The pair batted slowly in the first 10 overs and scored just 16 runs with just one four and the run rate was picked up after the 51st over. Watson hit the first six of the day in the 59th over and Clarke reached his fifty in the next over with a four. Watson followed him in the 62nd over by achieving his 19th Test fifty and got a lucky break when he was dropped by Mahela Jayawardene at first slip off Rangana Herath for 58 runs. Michael Clarke was the most aggressive of the two as the captain of Sri Lanka, Mahela Jayawardene, took the new ball in the 82nd over. Michael Clarke thrashed his first hundred at Melbourne Cricket Ground on the last ball of the 85th over and that was his fifth ton in 2012. The fourth wicket partnership contributed 194 runs as Michael Clarke was caught by Jayawardene in the third slip off Shaminda Eranga for 106 from 187 balls with 14 fours. 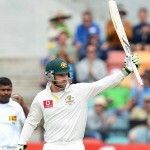 The fourth wicket fell down at 311 and two runs later Shane Watson was gone for 83 off 198 with 1 six and 8 fours. He was once again unable to convert his fifty into a hundred and managed just two Test tons. Watson was sent back to the pavilion by the rival teams four times in his nineties and thrice in his eighties during his 37 matches Test career. Matthew Wade became the next victim two runs later after scoring one mere run as Michael Hussey and Mitchell Johnson got together at the crease. Hussy looked like being in great nick again, he was sending the ball out of the rope frequently and Johnson was assisting him well from the other end. The duo enhanced the score to 376 when Michael Hussey was caught superbly by Herath off Tillakaratne Dilshan for 34 runs. Peter Siddle came in next as Johnson kept on securing his end while getting regular boundaries. 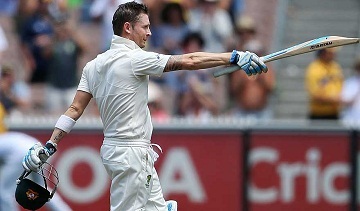 The fourth hundred of the Australian innings appeared on board in the 117th over and Johnson attained his seventh Test half century two balls later. The score was enhanced to 434 as Peter Siddle lost his wicket for 13 on the 2nd delivery of the 127th over and Nathan Lyon replaced him in the centre. The hosts powered 440 runs with two wickets remaining at stumps on day two, Mitchell Johnson was unbeaten for 73 and Nathan Lyon has yet to open his account. Dhammika Prasad was the top wicket taker with three, Shaminda Eranga held two whereas Angelo Mathews and Tillakaratne Dilshan shared one wicket each. Australia secured a commanding first innings lead of 284 runs with few more runs still to be added and the Sri Lankan batsmen have to work hard if they want to avoid another defeat.